A table tennis website for your perusal. Ping pong is a sport that can play indoor and outdoor. Home Table Tennis Tips Ready to Become an Awesome Table Tennis Player? Ready to Become an Awesome Table Tennis Player? If you read some of my previous lenses, then by know you have mastered the basic, legal table tennis serve. But that’s not where the table tennis serving lesson ends. Now you got to add some fancy moves. Are you ready for more advanced table tennis serving techniques? First, you need a good racket! This is an ultimatum. You can’t do any fancy serves if you have a low-quality racket with cheap rubbers that fall off after a few strikes. Thus, you need to make sure you have a good racket. Please don’t buy those cheap table tennis rackets in 99 cent shops. Ok, I understand – spending fifty dollars or more does not seem very alluring. But have you heard of that saying “I’m not rich enough to buy cheap stuff.” Aside from reducing your playing ability, cheap rackets get destroyed very easily, especially if you play extensively. So instead of buying five or six times a cheap racket, why don’t you just spend a large portion of money at once and buy a racket that will not only last longer but will be much better to play with. Don’t be hesitant. Treat yourself with the best equipment. Here is your advanced table tennis serving technique #1. Reverse pendulum serve creates a great counter-clockwise spin (if you are right-handed). To create this type of spin, you have to strike the ball with the part of the racket’s surface that is close to the handle. Here is a nice video explaining the technique. The guy does not seem very enthusiastic, but if you ignore his monotonic voice and just concentrate on the information he provides, you will learn how to utilize this technique. There is only one area where you are allowed to stand when you serve – behind the end line of your side of the table. And this means that your feet, your hands, your body, everything needs to be behind that line. When you prepare to serve, both the hand holding the racket and the hand holding the ball need to be behind that end-line. It is really your choice where you are going to position yourself when you serve. Any place is fine, as long as you are behind the end-line. Usually, if you are using a forehand serve, you should serve it from the backhand corner. However, this is not a rule, so it is up to you. This is the part that many beginners mess up. Keep in mind two things: 1) the opponent needs to be able to see the ball at all times and 2) the ball needs to be tossed upwards before being struck. Ok, so what does that mean? In your primary hand (right if you are right-handed, left if you are a lefty) hold the racket. In the other hand hold the ball. Place the ball in the middle of your palm. The palm needs to be held flat. Hold your palm parallel to the table. Now toss the ball. The official table tennis rule is that the ball needs to be tossed at least 6.3 in (or 16 cm) up before striking it. So toss the ball to at least this height and then when it starts descending, strike it. Higher you toss the ball, more power you will get when striking it. And now the final part – where is the ball supposed to bounce? Well, repeat in your head this: “bounce-bounce”? Got any idea? Yes, it has to hit the table twice. First, the ball has to hit your part of the table and then the opponents. If you play singles, then you do not need to care which side of the table to send the ball to. 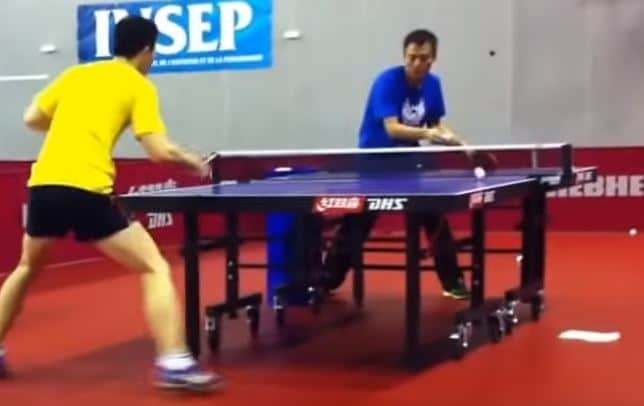 You have probably noticed that there is a white line on the table that divides the left and the right side, but it is there only for those who play in doubles. If you play 2 vs 2, you serve from the left side and you have to serve it to your right (the ball first hits your left side of the table and then the opponent’s left side) and vice verse. So those are the basics of how to serve in table tennis. But learning to play it the right way is just the beginning. Now you need to start practicing your serve and make it your most powerful weapon. There are one really spectacular and concise table tennis guidebooks that you can get online. The book is Table Tennis Tales and Techniques, written by Larry Hodges. It features tips from this world-famous table tennis player and USA Table Tennis Hall of Fame player. The book teaches you everything you need to know to become a professional table tennis player: deadly strokes, corkscrew spin, footwork, returning backspin serves, as well as many funny stories. The advantage of this book, when compared to other books on Table Tennis, is that it takes out all the unnecessary things, and instead of reading hundreds of pages about a serve or footwork, it gets straight to the point and tells everything in as few pages as possible. I recommend that you check the Megaspin’s website (by CLICKING HERE) to get more info about the book’s content and how to order it. Another great way to learn how to serve in table tennis and other tricks is by watching instructional videos. It is probably even more useful than reading instructional books. Unfortunately, table tennis is not the world’s most popular sport so there are not many of those videos available, but you can still get some on Megaspin. Learn the tactic on how to win at ping pong by watching relevant DVDs will be very effective in improving your overall skill. Killerspin Success in Table Tennis DVD – 2nd Edition, also available for order, is the digital version of a classic table tennis guide by Killerspin. This serve creates such a powerful backspin that it sends the ball flying back towards the net. The serve is also known as Ma Lin’s ghost serve. Ma Lin is a Chinese table tennis player who was several times a world champion. Watch the video below to learn how to do this serve. Physical training, not at the table, is really important. This aspect must not be neglected. It can prevent injuries and increase performance. Table tennis is a speed sport. It is dangerous to get ankle injuries by moving quickly. That’s the reason why the appropriate equipment and good shoes are very important pieces of equipment. Low shoes help prevent ankle sprains. It is important to have two rackets with you all the time. The second racket needs to be ready to use. If you break your racket during a match, you will have the second one to use and won’t have a problem trying to find another one to finish your match. A good physical warm-up is necessary before playing table tennis. This will wake your muscles up and prevent injuries. It is important to do a good stretch at the end of a day of training or at the end of a competition. Doing this, you will be able to play more often and longer because your muscles will stay more relaxed day after day. The opposite will happen if you don’t stretch. The day before a competition, it is important to eat well and to sleep well. During a day of competition, it is better to eat little snacks all the time than a big meal. It can be useful to record your matches to analyze your technical shots and adjust what is not working well when you come back to training. Energy drinks such as Gatorade are a good option for a long day of competition. At the end of the day, you can drink one of these to revive some tired muscles. As you probably know, you are allowed to use a towel every six points during a match. You can use this moment to think about the tactical aspects you should use against your opponent in the points that will follow the pause. In table tennis, practice at the table is inevitable, but the physical training is also really important. It raises the level of your game. Running is a very good way to improve your cardio. Running works directly on your physical endurance, and you can see the results at the end of the day of competition. If you always play against the same players, you can start to be mentally lazy. That’s the reason why it is important to play against a large variety of players. perhaps when you rubbers have not been used for few hours. For instance, just take your rubbers and put one layer of glue on them and put them back on the blade right away without letting them dry. After 5 minutes, take off your rubbers and do your regular gluing. If you are using a new set of rubbers for competition, try to put a few layers of glue the day before the competition. Otherwise, only one layer of glue prior to a match will not give you the best result in terms of speed. Before a match, make sure to select a proper ball. Quite frankly, the percentage of table tennis balls being totally round is quite low. Choose the best one in terms of roundness and the one that is equally hard over the entire surface. Bring always a towel even if you do not really need one in a match. It’s always good to break the rhythm if you lost a few points in a row. After 6 points, take your towel and regroup or refocus. How Useful is Shadow Play?